This story is a reprint from Unwinnable Monthly #104. If you like what you see, grab the magazine for less than ten dollars, or subscribe and get all future magazines for half price. This series of articles is made possible through the generous sponsorship of Epic’s Unreal Engine 4. 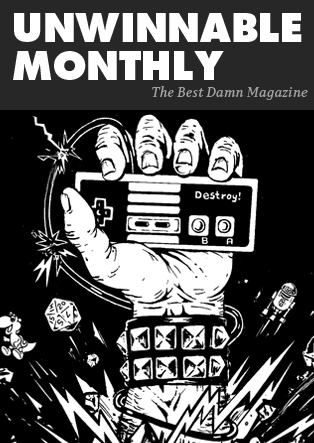 Every month, we profile the recipient of an Unreal Dev Grant. While Epic puts us in touch with our subjects, they have no input or approval in the final story. What do you do when you’re fighting a big gun? Build a bigger gun, naturally. If their gun has five chain guns, an energy beam and a lava splasher, then by golly, you gotta find a way to build a gun with six chain guns, a disintegrator and a black hole generator, right? You probably think I am being facetious, or making a satirical point about military escalation, but nope, I am serious – though serious in the most ridiculous way possible. 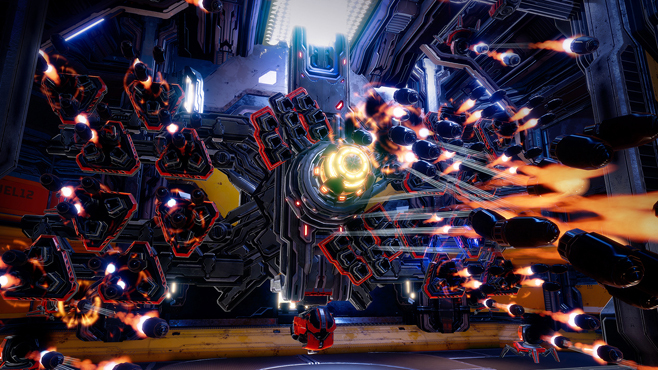 Let me introduce you to Mothergunship, a game about making improbable guns in order to fight improbable odds, currently being co-developed by Grip Digital and Terrible Posture Games. The focus on guns and ridiculousness is nothing new for game director Joe Mirabello, whose previous game, Tower of Guns, was a humorous FPS riff on roguelikes centered on, well, the word “guns” is in the title. 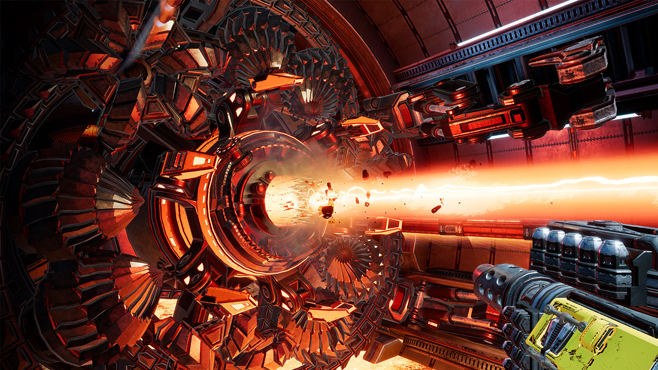 I spent some time with Mothergunship’s Gun Crafting Range demo, building preposterous weaponry and testing them out. The results were a mix of hilarious, bracing and sometimes even elegant. Once I got out of the test chamber, I chatted with Joe about guns, comedy in games, guns, the lessons he learned from traditional bullet-hell games and guns. When I played the Gun Crafting demo, I thought, “My god, it’s like Kerbal Space Program, but for guns.” What inspired Mothergunship? That’s a wonderfully flattering comparison to make! While we were not inspired by Kerbal directly, there have been a number of other build-a-ship-out-of-modular-components games over the years and the general concepts of fitting pieces to sockets was definitely an inspiration. 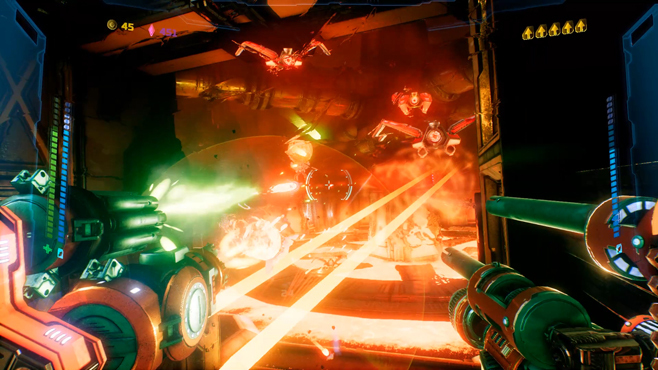 We knew from the get go that we wanted to have some form of gun customization within Mothergunship, but we were not quite satisfied with the weapon customization options we’d seen in other first-person shooters. They all seemed either too cosmetic or too grounded in reality. We wanted something that allowed for more creative expression. The absurdity of the system we ended up with then informed a lot of other aspects of the game too; everything from the combat to the humor in the story line. With you following up Tower of Guns with Mothergunship, I am beginning to detect a theme. What is it about making unusual gun-centric games that appeals to you? Hah, well, to be fair, Mothergunship started its life as a sequel to Tower of Guns. It was only after a couple of months of development that we realized the game needed its own identity. However, there’s still a lot of shared DNA between Tower of Guns and Mothergunship, and we wanted a name that carried with it a fitting tone. It was one of the founders of Grip Digital who suggested the name Mothergunship, half as a joke, but the name stuck. It’s hard to imagine the game ever being known as anything else now. After working on an MMO, you wanted to make a single player game on your own, and made Tower of Guns. 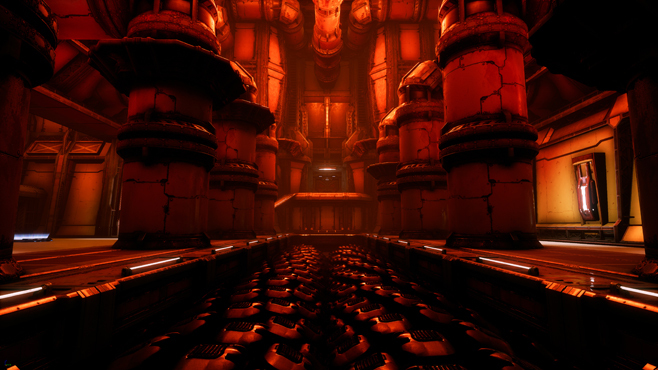 Along those lines, then, what are you personally hoping to accomplish with Mothergunship? You’ve done your research! For me personally, I had taken a long solo sabbatical in order to complete Tower of Guns, but I still treated the game almost like an experiment: an experiment in design mechanics, an experiment in development methods and an experiment in my own ability to work independently from a studio environment. But I still saw all these as proofs of concept, and Mothergunship has allowed me to refine those ideas greatly and deploy them with a much larger scope than I’d ever be able to do solo. That’s where Grip came in. They are not just a publisher here, but a full partner, taking on huge aspects of development, marketing and logistics. This project has gone so much further than the humble beginnings of Tower of Guns. Now, I can’t speak officially for Grip here, but they stepped in back in late 2014 to help with the console ports for Tower of Guns, and we kept on working together ever since. I like to think they saw merit in the general ideas behind the game and, likewise, wanted to explore them further, perfecting their own abilities as a development studio along the way. How did you go about creating a gun modification system that is so varied/modular/silly? Well, first it would be disingenuous for me to take any personal credit for that system. As I recall, Grip’s founders charged me with coming up with a crafting system that added a layer of customization to the game. This was back when this game was a sequel to Tower of Guns, and before it gained its own voice as Mothergunship, and this seemed like a good way to address one of the primary concerns players had with Tower of Guns: namely, we wanted to add more gun variety into the game. Myself and one of Grip’s engineers prototyped a single socket gun customization system similar to many other FPS gun customization systems which allowed for some interesting results, but no one was thrilled with it. However, we then began to explore the idea of pieces with sockets being added onto other pieces with sockets – basically, allowing for endlessly modular grafting of parts. We quickly realized this system was absolutely ridiculous. It would have huge performance and balance repercussions, introduced a ton of design problems, and would look and feel completely absurd . . . so we had to build it. 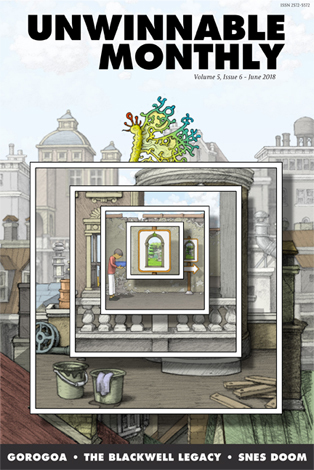 After all – absurd and ridiculous and over the top were all monikers we were already striving for. Few other FPS games were likely to go this direction. Once we settled on a direction and hammered out some design problems, it then took months to build out the system and we are continually improving it even now. I love how, in attempting to level the unbalanced playing field that exists in most bullet-hell games, you’ve made a game that actually feels even more bonkers. So, two part question: what did you learn from earlier bullet hell games and what’s your design philosophy for bonkers? How much bonkers is just enough bonkers? So, traditional bullet-hell games present some interesting concepts, but the 2D lateral nature of them means that making cool patterns and rhythms behind bullets is much more rewarding than it is in a 3D space. Our job was more about adapting some core concepts from bullet-hells instead: that bullets move slow, that there are spaces between them, that the player is encouraged to dip in and out. The goal was to recreate the sensation that you could, quite literally, dance in and out of a large field of bullets. That was a key takeaway from Tower of Guns, which is where I first explored the slow-moving bullet FPS idea. 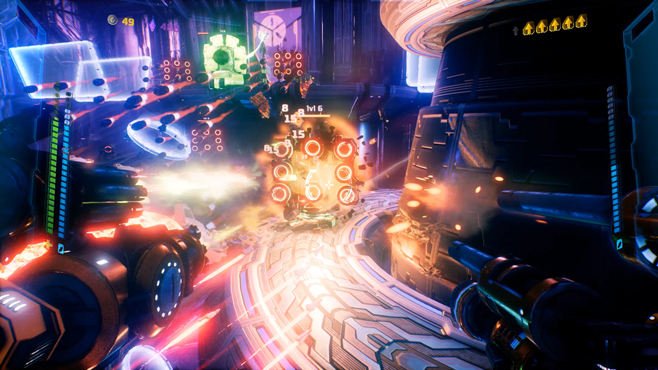 For Mothergunship we began exploring other influence and those influences are all over the place: space simulations, sidescrolling shooters, roguelites . . . we don’t hold back in our search for learning how other people solved similar problems. As for “bonkers,” well, it only seemed fair that if you’re going to give the enemies a lot of firepower in a game, it’s a logical evolution to tinker with the idea of giving the player firepower to match. The tricky part is making sure that any spikes in feeling overpowered don’t break the game for long and it’s a definitely not an easy relationship to balance. A lot of other games file away the sensation of overpowered-ness, rather than embracing it and incorporating it, which is what we strive to do. Mothergunship encourages and expects bonkers situations to happen, the trick is making sure it doesn’t overstay its welcome. There aren’t a lot of games out there that succeed at being funny, but judging from the demo, Mothergunship is one of the few. What’s your approach to comedy in games? First, try and put aside other people’s opinions on humor: feedback is good, but if you try and please everyone you end up with a disingenuous voice, canned jokes and, essentially, the soulless attempts you see in many larger budget games. Second, don’t write jokes. Jokes aren’t funny. Instead, create characters that are foils and put them into weird situations. I try and let the situation drive the comedy, not the joke . . . and jokes come out of that. Four, stay up till 3 am. This spawns all those stupid ideas that don’t seem rational during the day. Find good voice actors. Good writing is bad writing with a bad actor. Bad writing can be good writing with a good actor! The delivery is as important, or maybe more, than the writing. If you aren’t having fun writing it, scrap it. It’s not funny. The death of comedy writing is forcing it. Why did you choose Unreal Engine 4? Are there any unexpected benefits or challenges to using the engine? Well, there are always benefits to licensing an engine: like having the toolchain for authoring content largely stable for example, or having core technologies being handed to you feature complete, ready to build with, or being able to hire new people who are already trained up on 90% of your toolchain, or being able to draw from prior experience and lessons as you grow from using the same engine from project to project, rather than reinventing the wheel, or being able to lean on Epic to help you reach a larger audience. It’s easy to forget what life was like before Unreal, when you spent years on a project simply making it possible to make a game due to the tech ramp up and only then could you move on to iterating on the game itself . . . and even then, no one except you knew how any of it worked. As for challenges, there are some. For example, upgrading to a new version of the engine comes with it the joy of new toys, new features and new bug fixes, but also does introduce the risk of introducing new bugs that slipped through Epic’s checks, or some technique you relied on getting deprecated in favor of new methodologies. These challenges are hardly unique to Unreal and, unlike some competitors, Unreal Engine 4 is not a black box – much of Epic’s source is available for scrutiny and their community is active and thriving, meaning such issues are as quick to resolve as they can be, but it’s still something you have to keep your eye on. Has the Dev Grant allowed you to do anything you otherwise would not have been able to? Absolutely. I mean, first, there’s the monetary value. The benefits of that are obvious and greatly appreciated. But there are a lot of benefits about the Epic Dev Grants that go unspoken. For example, being a recipient of that grant opens doors; the press are more interested in talking to you, new business opportunities present themselves and, in general, everyone will take you more seriously as the Grant presents some really wonderful external validation. And that validation brings benefits even within the team itself: our Epic Dev Grant was awarded at a time when we were struggling with whether or not this idea would be something other people enjoyed and it presented us with one of a real signal that someone else might find it compelling. That right there is a powerful motivator to push forward and make the best game possible. Follow Mothergunship’s development at Mothergunship.com.